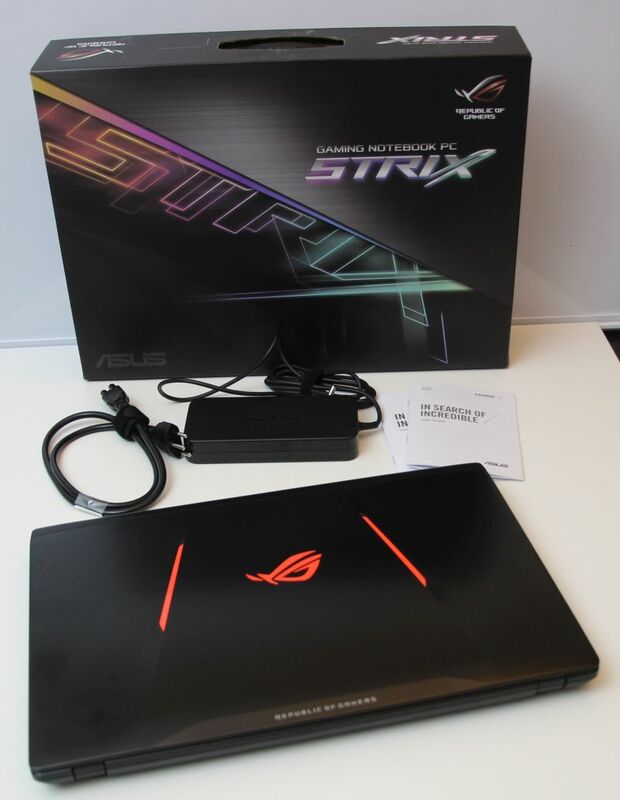 ASUS ROG Strix GL553VD is a gaming notebook that features an Intel Core i7 7700HQ CPU (Kaby Lake) and an NVIDIA GeForce GTX 1050 GPU (Pascal architecture). The quad-core i7 7700HQ supports the hyperthreading technology meaning you have 8 logical CPU cores. 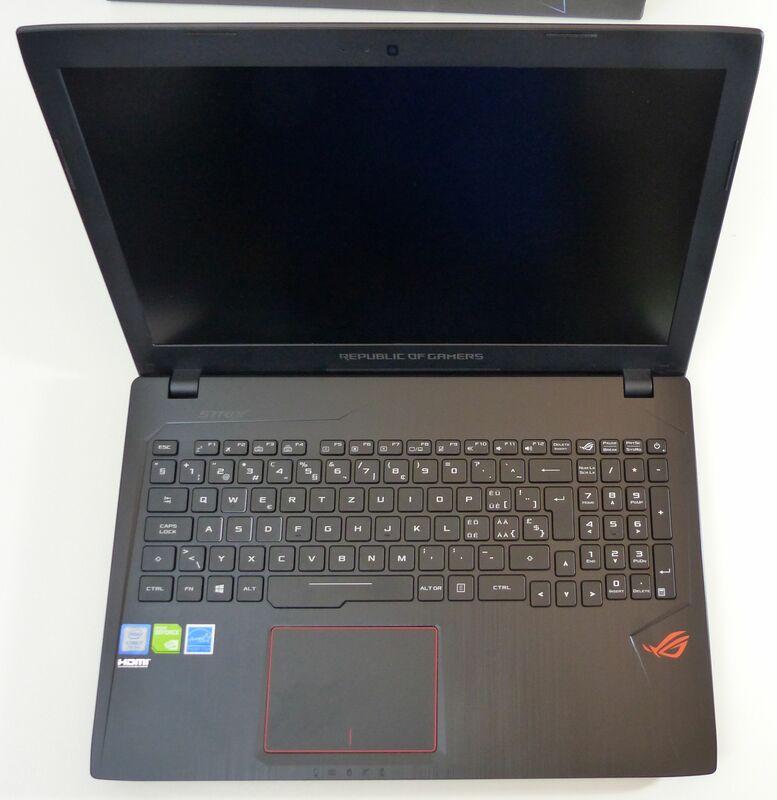 The GL553VD comes with a 15.6-inch 1920×1080 anti-glare display panel, 16GB of DDR4-2400 system memory as well as two storage units: a 128GB SSD M2 unit (for system) and a 1TB 7200rpm hard disk. More marketing information about the GL553VD can be found HERE. Let’s start with the bundle. 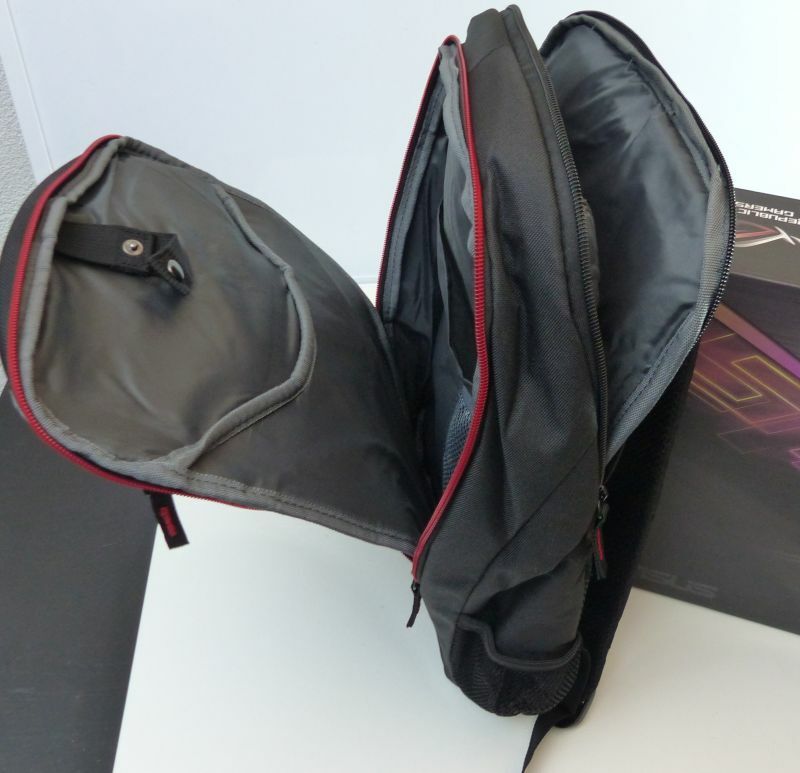 It includes the notebook, a power supply, some paper docs, and… a backpack! The keyboard is very comfortable and is illuminated (AURA illumination). 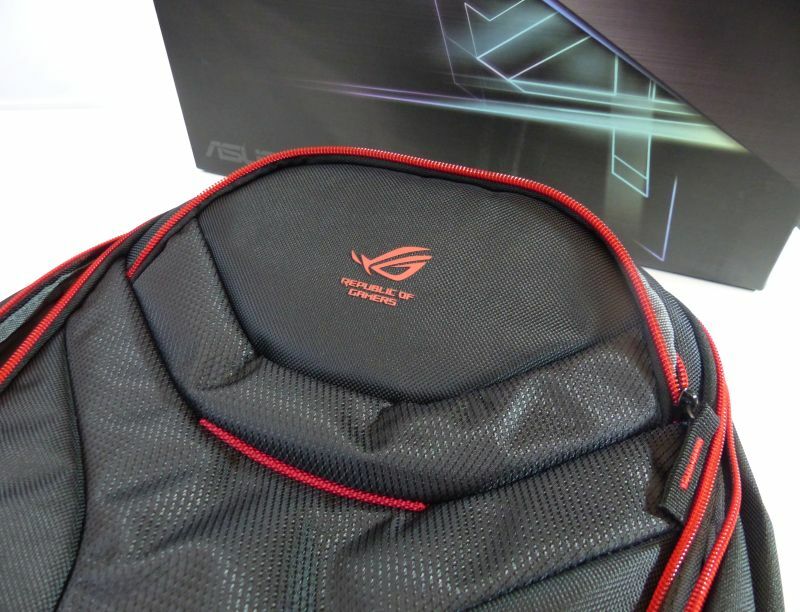 ROG Strix GL553 has a specially-designed chiclet gaming keyboard with 4-area RGB lighting and red-backlit scissor-switch keys that offer you 2.5mm of travel distance for tactile keystrokes. It also features highlighted WASD keys, so you know where your hands need to be. 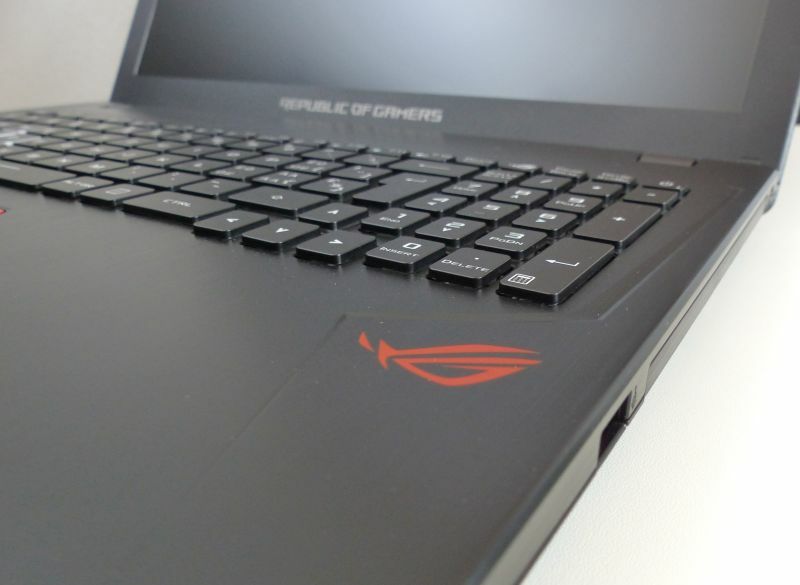 On top of that, a larger space bar and isolated arrow keys ensure that everything you need is kept within easy reach. The connectors on the left side. From right to left: 1 X audio jack, 1 X USB 3.1 type C, 2 X USB 3.0, 1 X HDMI 2.0, 1 X LAN RJ45, and the power connector. The connectors on the right side. From right to left: the DVD drive and 1 X USB 2.0 port. The back side. 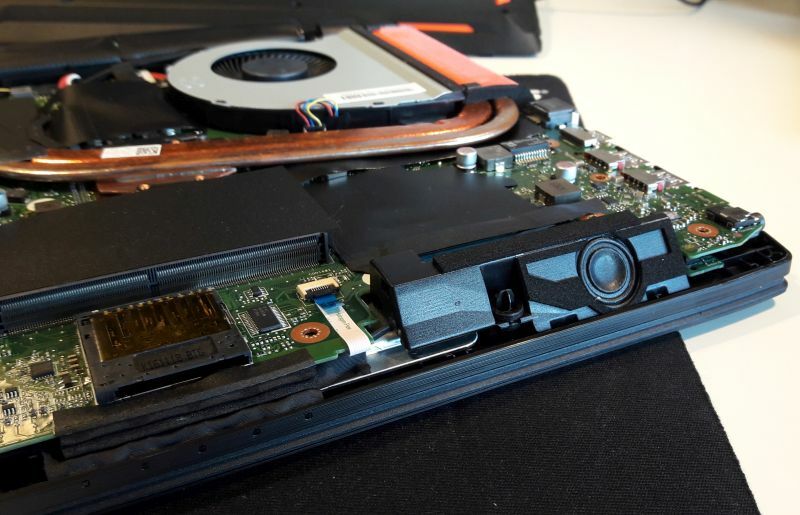 We can see the SD card reader in the front (under the touchpad). Once you had removed something like 11 screws, you can access to the internals. 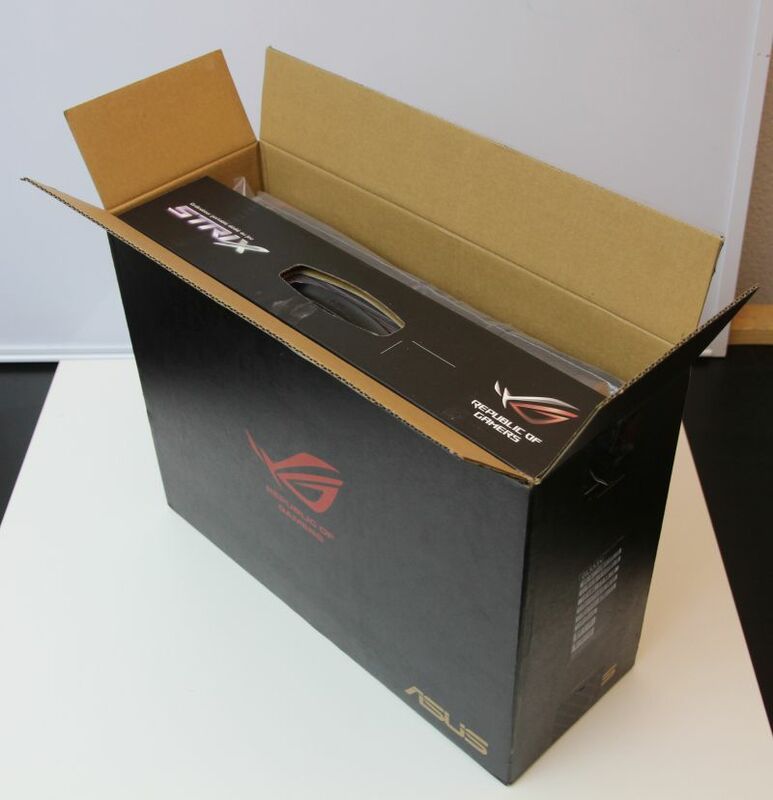 You can then upgrade the storage units or memory modules. 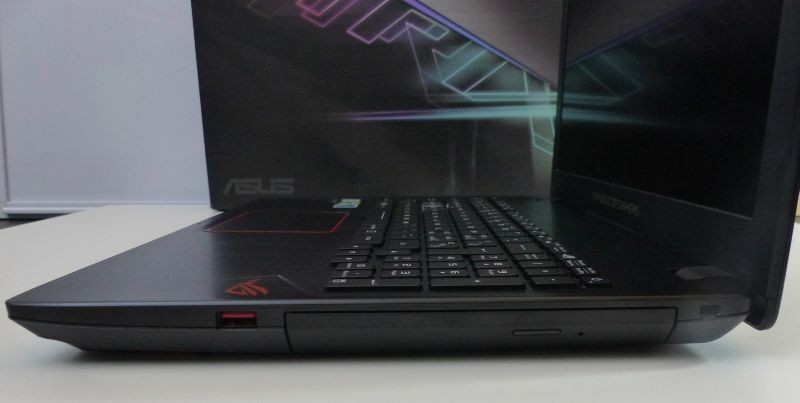 The GL553 comes with 2 speakers that produce a pleasant and clear sound (better than ASUS G752VY one…). These built-in speakers direct sound towards you and the result is a good sound. 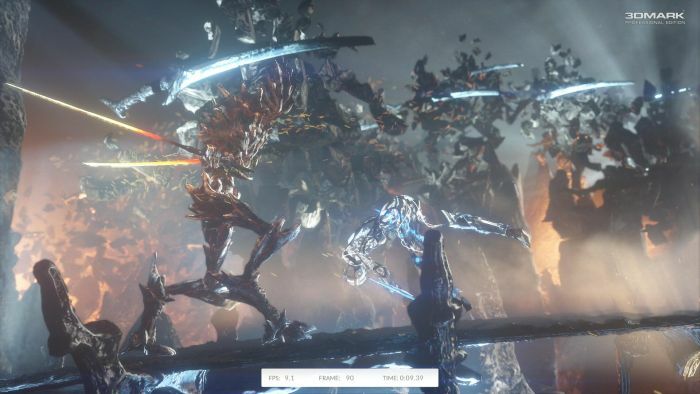 Some screenshots from various system tools: GPU Caps Viewer, GPU-Z and HWiNFO. This NVMe 128GB SSD boot disk offers correct read speed (538 MB/s) but poor write speed (182 MB/s). I will do a serious upgrade of this ssd in an upcoming article, so stay tuned. 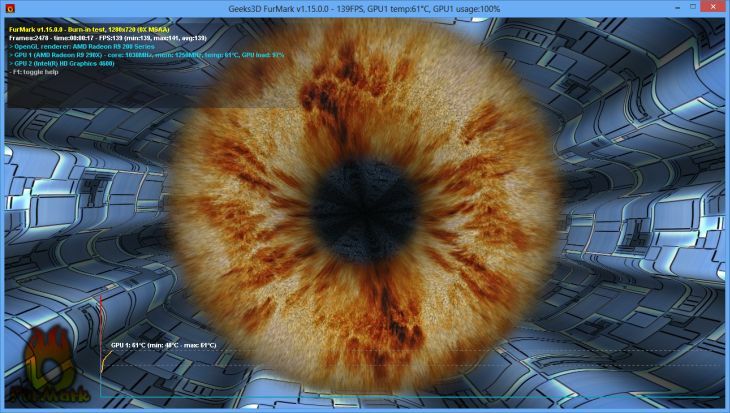 This quick burn-in test has been done with Geeks3D FurMark 1.18.2. 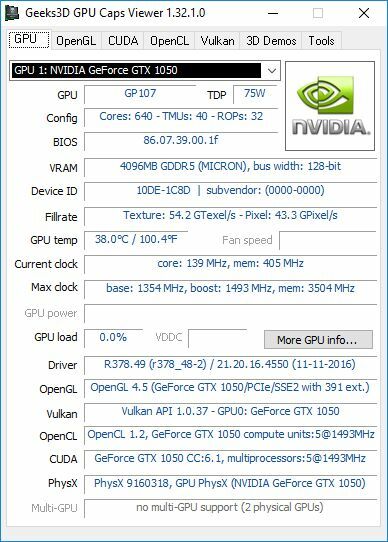 The goal is to see if GPU throttling is present. It was a good surprise. There is no throttling at all. 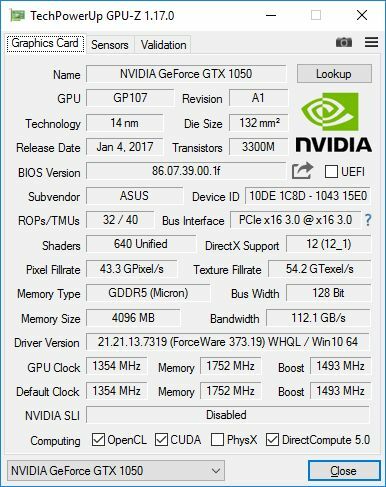 The base clock of the GTX 1050 is 1354MHz and the boost clock is 1493MHz. 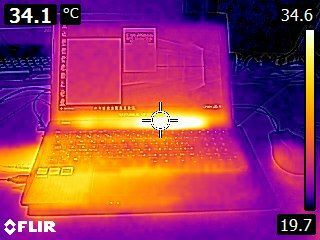 During the FurMark test, the GPU core was clocked at 1430MHz with a GPU temperature of 73°C. 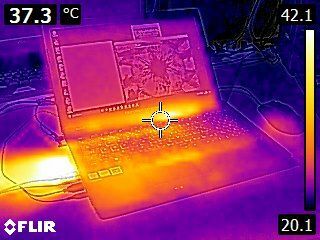 At idle, the GPU temperature was around 39°C. And the noise? At idle the noise is barely audible, we can hear the fan but it’s very acceptable. Under load, it’s another story, the fan noise is loud. 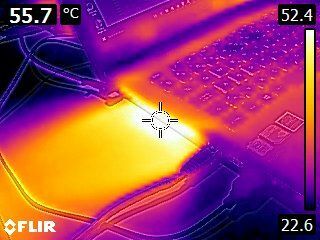 Look at the thermal imaging under load and you will understand. Let’s start with the thumb-up things. The GL553 features a brand new Kaby Lake Core i7 7700HQ CPU (with 8 logical cores) and a Pascal-based GeForce GTX 1050 GPU. 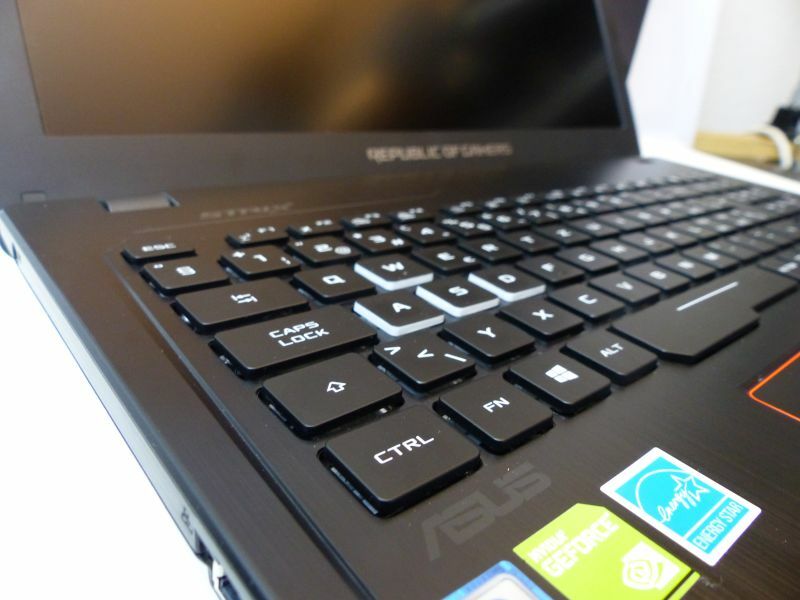 The keyboard is very pleasant and the RGB backlighting is very cool (colors can be customized with the AURA software). The audio system (essentially the speakers!) produces a correct sound and the fullHD anti-glare display (1920×1080) with wide viewing angles is excellent. The DVD drive is handy and the presence of a RJ45 connector is very appreciable. 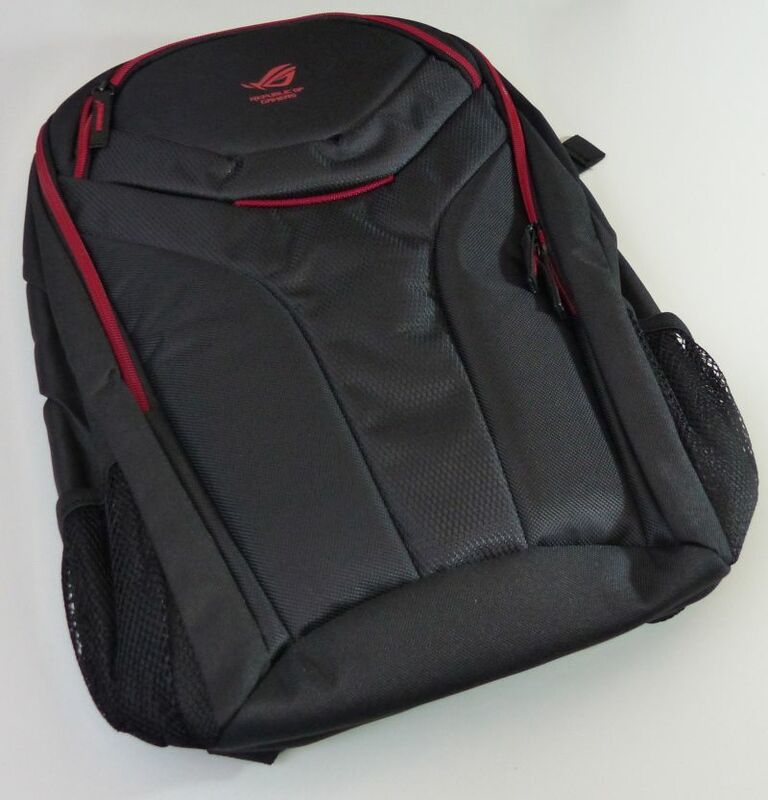 The backpack is also a nice surprise. I like it. 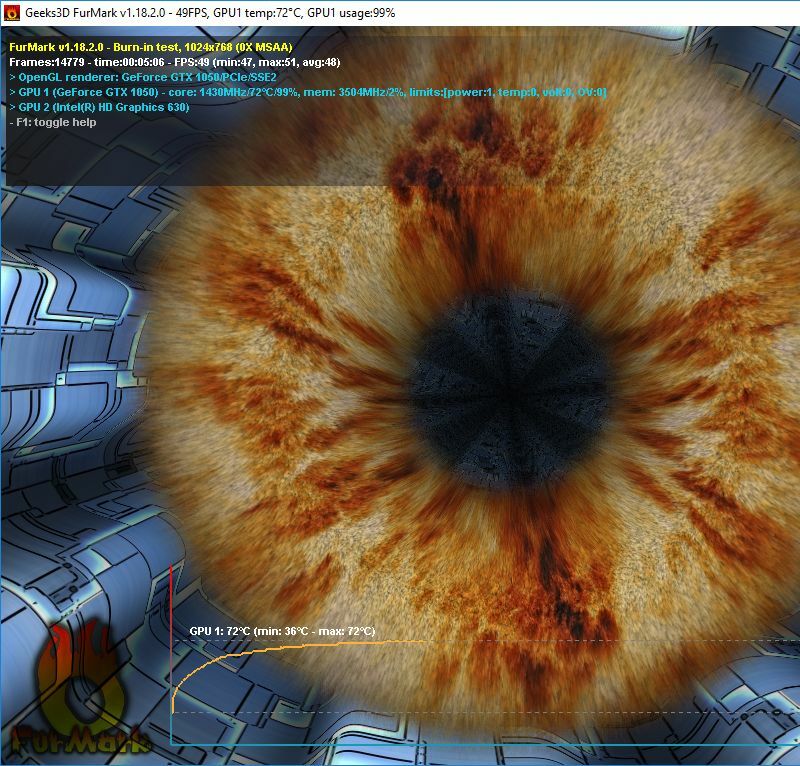 There is no GPU throttling which is very good (not like on the G501VW with a GTX 960M!). 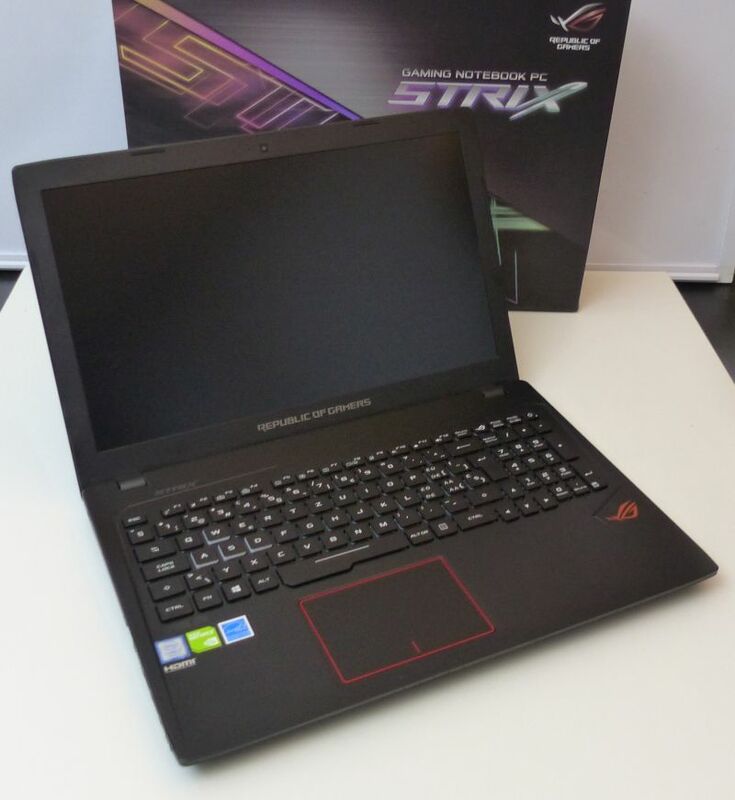 This GL553VD comes with 16GB of DDR4-2400 memory. This is a correct amount of system memory and should be enough in most of cases. But if you need more memory you can add a second 16GB module for a total of 32GB. Now the thumb-down things. With a fresh install of Windows 10 (I always do fresh install of Windows on notebooks), the notebook is noisy. Not all the time but often. You launch firefox and you hear the cooling fan. You unzip an archive and you hear the cooling fan. Actually you hear the cooling system very often for common 2D tasks on Windows. I don’t talk about 3D applications and video games. I talk about non-intensive tasks. Okay we have a Core i7 7700HQ but this kind of noise is not acceptable in 2017! 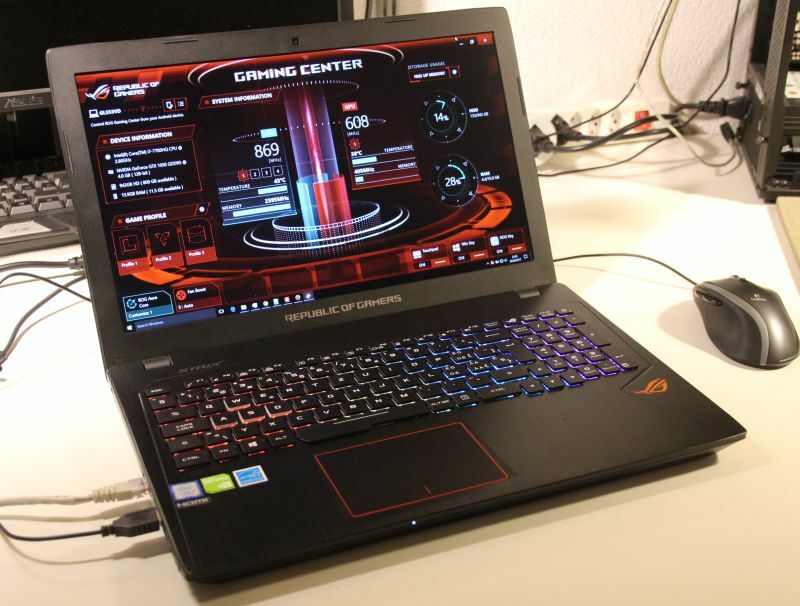 I would have put a faster boot disk in this kind of notebook. 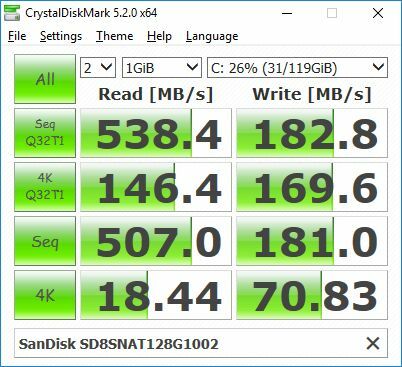 The Sandisk offers good reading performances but writing performances are similar to mechanical disks… In a next article, I will replace the Sandisk by a really fast SSD (Update – 2017.02.13: GL553VD updated with a Samsung 960 PRO). With a poor 3-hour battery life, don’t forget the power adapter! All the previous drawbacks can be fixed and when they are fixed, the GL553VD is a nice notebook. 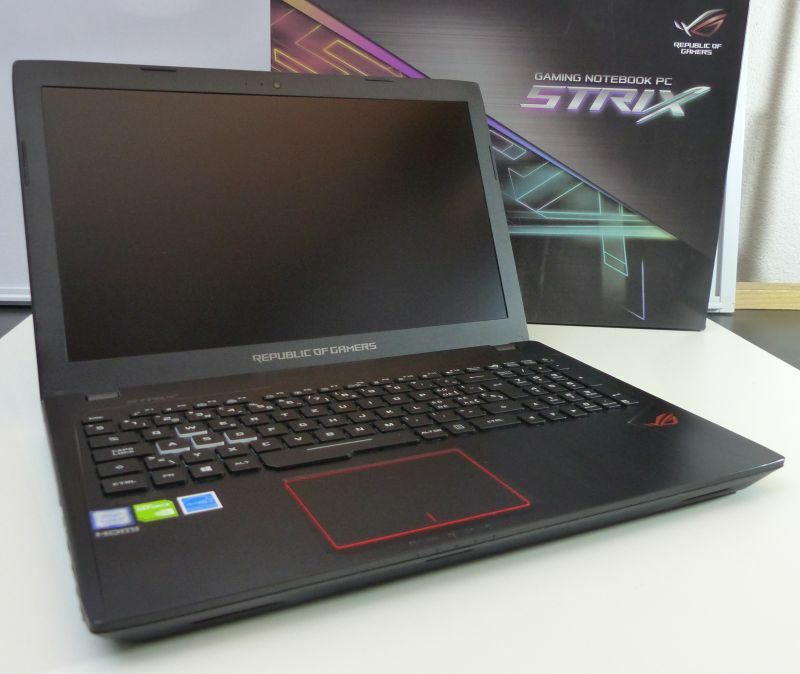 It’s not the ultimate gaming weapon because the GTX 1050 is rather an entry level GPU but for a graphics developer, this notebook is perfect. 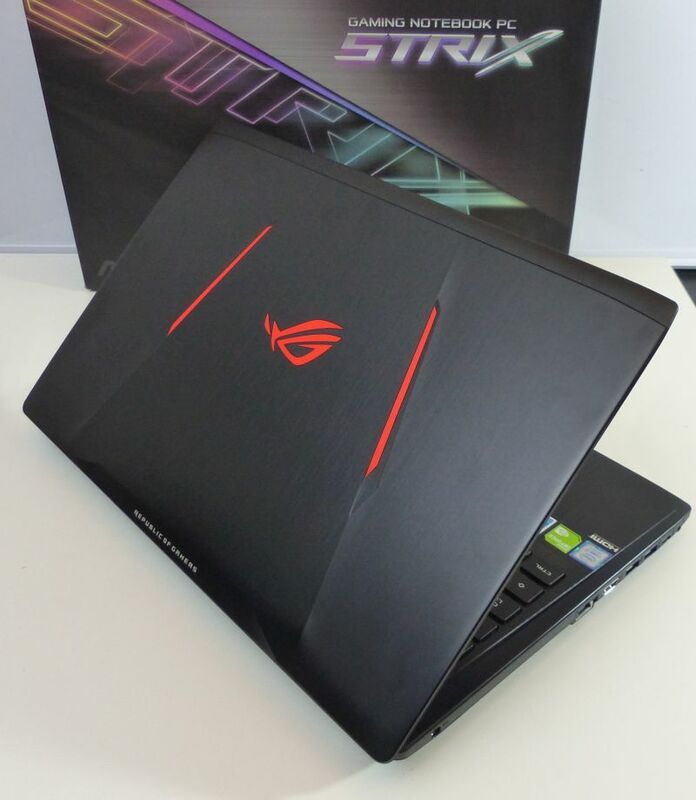 If you need a 15-inch gaming notebook with a reasonable price and a nice design (black brushed aluminium case), the ROG Strix GL553 is a good choice. When can we expect next article about GL553VD? (nasty noise & fast SSD). very shortly. I hope towmorrow or maybe next monday. Hi, I am experiencing one issue while using this laptop. 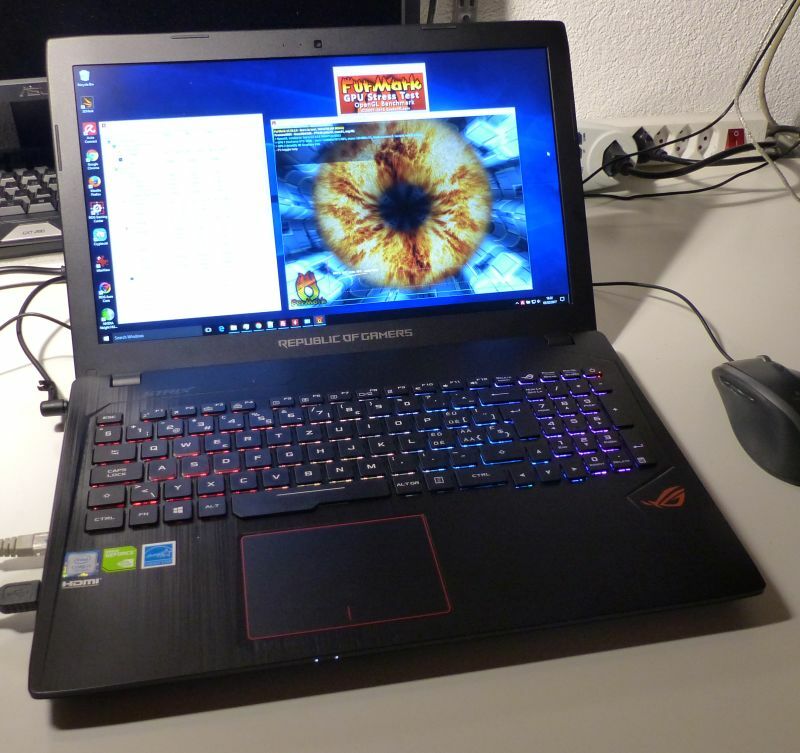 Every time I turn on the Laptop (it freezes during start up) if peripheral devices (mouse and keyboard) are connected to it. If not, then windows loads properly and I can plug the peripheral devices and it works successfully. 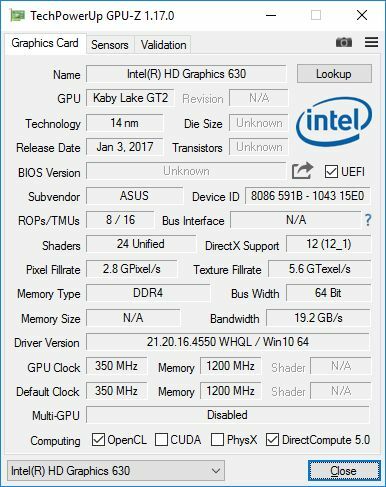 Is it an issue with the BIOS ? or what should I do ? 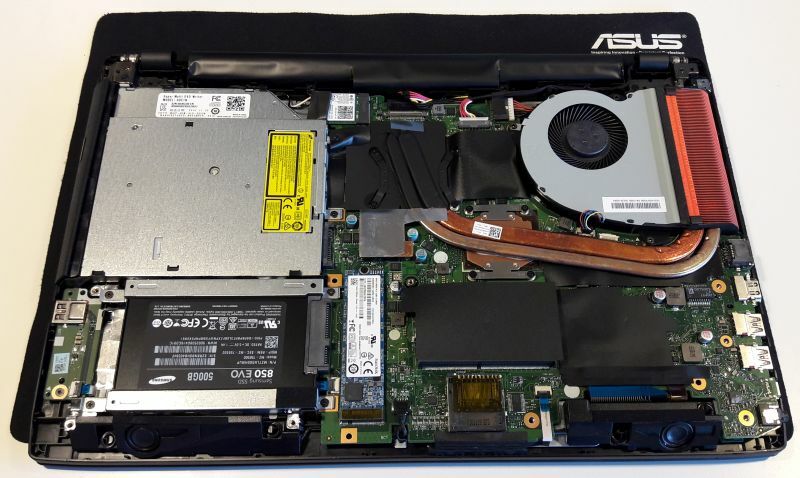 I want to buy ASUS GL553VD-DS71 15.6, but in its specification , there is no ssd card and really now i don’t want to spend money for ssd card. I want to know , is there any input for ssd and can I add ssd cared in future? is this ssd upgradable ?????? Are you sure the HDMI port is 2.0 and not 1.4? 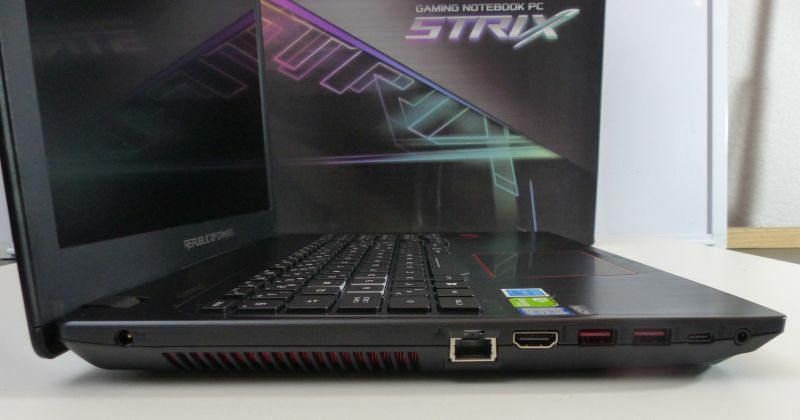 Can I upgrade this laptop to a GTX 1080 and if so, where can I get the card for a laptop? I bought this Laptop in bestbuy.ca. In task Manager, I see the RAM slots as 4. How many slots does it actually have and what is the maximum limit for each slot? 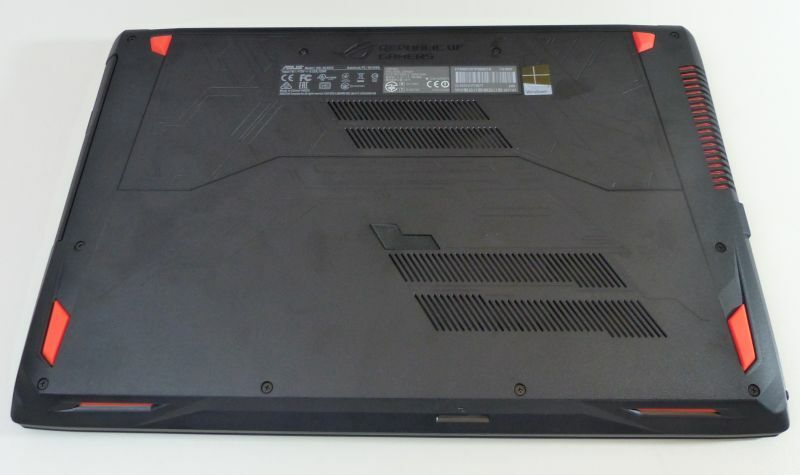 Can you recommend me for this laptop a docking station? 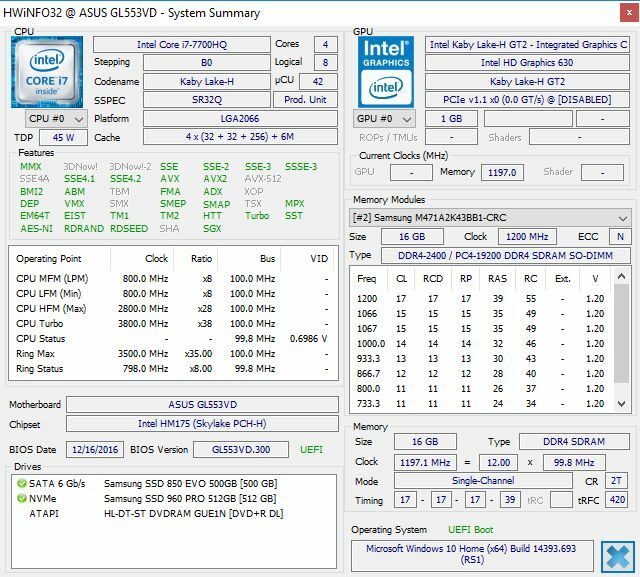 can someone tell me if the 2.8 Ghz is upgradeable ? sir i have a question? 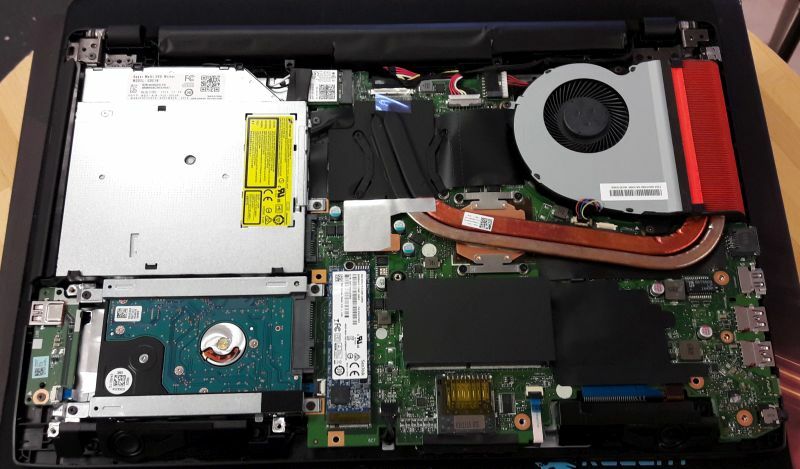 could i replace the optical disk with an HDD or SSD?